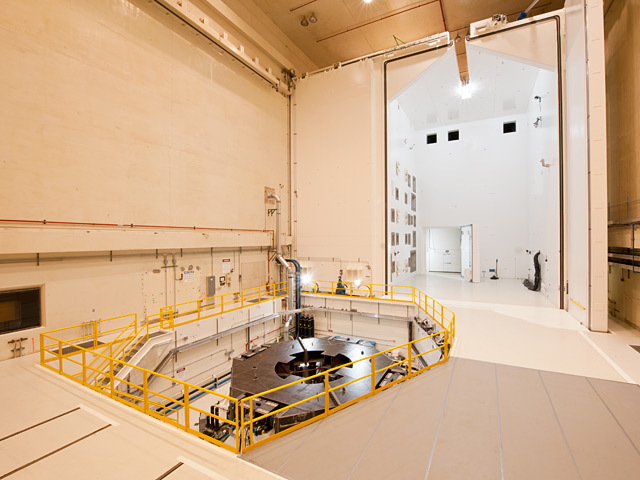 The Space Power Facility (SPF) houses the world’s largest and most powerful space environment simulation facilities. 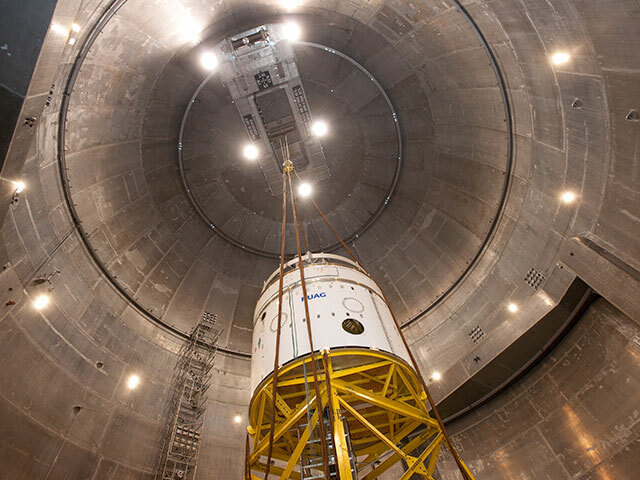 The Space Simulation Vacuum Chamber is the world’s largest, measuring 30.5 m (100 ft) in diameter by 37.2 m (122 ft) high. 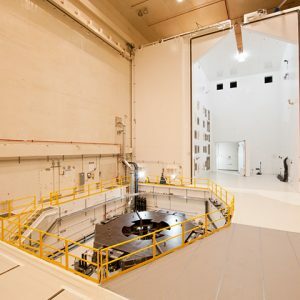 The Reverberant Acoustic Test Facility (RATF) is the world’s most powerful spacecraft acoustic test chamber, and the Mechanical Vibration Facility (MVF) is the world’s highest capacity and most powerful spacecraft shaker system. 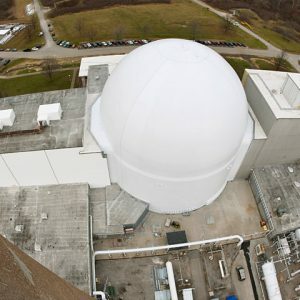 The SPF is located at the NASA’s Plum Brook Station in Sandusky, Ohio. This website provides information on the capabilities of this facility and the supporting infrastructure. The facility is available on a full-cost reimbursable basis to government, universities and the private sector. Space Power Facility (SPF) aerial view. The vacuum chamber was designed and constructed to test both nuclear and nonnuclear space hardware in a simulated low-Earth-orbiting environment. Although the facility was designed for testing nuclear hardware, only non-nuclear tests have been performed throughout its history. 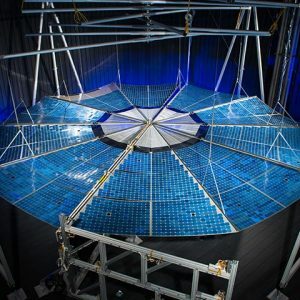 Some of the test programs that have been performed at the facility include high-energy experiments, full-scale rocket-fairing separation tests, Mars Lander system tests, deployable solar sail tests and International Space Station (ISS) hardware tests. 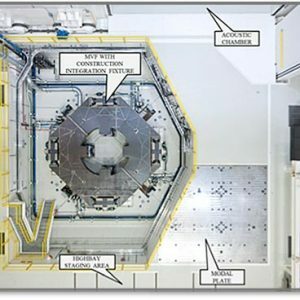 The chamber can sustain a high vacuum (10 to 6 torr) and provide an optically tight, high-emissivity, thermal background environment of –160°C to 60°C (–250°F to +140°F) within the 12-m- (40-ft-) diameter by 12-m- (40 ft-) high variable-geometry cryogenic shroud. The facility can also provide power systems and thermal controllers for customer-provided thermal heaters or solar simulators. The vacuum chamber has a volume of 22,653 m³ (800,000 ft³) and measures 30.5 m (100 ft) in diameter and 37.2 m (122 ft) high with 15.24-m (50-ft) by 15.24-m (50-ft) loading doors on each side leading to high bays. 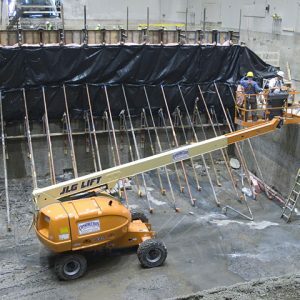 The chamber features all-aluminum construction, including a removable polar crane with an 18.1 t (20 ton) critical lift trolley and a 9.1 t (10 ton) auxiliary hook, and a removable, reconfigurable, cryoshroud system. The chamber cryoshroud system can provide both warm and cold thermal background environment, data acquisition and test monitoring capabilities. 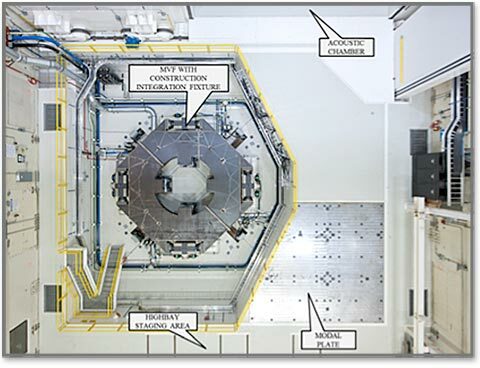 The vacuum chamber is surrounded by an equal-volume concrete enclosure which is typically reduced in pressure to 20 torr during chamber operations.The vacuum chamber incorporates several electrical and instrumentation penetrations, and several blank penetrations at various locations around the chamber perimeter. Removable rail tracks in the chamber can be used in conjunction with rail dollies or the cryoshroud floor(s) to transport hardware or test articles through the facility and chamber. The facility provides a visually-clean environment. The chamber provides an empty-chamber vacuum capability of 2×10–6 torr using a combination of roughing pumps and high-vacuum equipment. The roughing system consists of two identical 5-stage, parallel trains of rotary-lobe blowers and rotary-piston mechanical pumps, which pump the chamber and annulus simultaneously to 20 torr, and subsequently the chamber only to 30 mtorr. High-vacuum is achieved using 5 turbomolecular pumps and 10 cryogenic pumps. The chamber can reach a vacuum level of 2×10–6 torr in less than 8 hr. The facility uses a removable, reconfigurable, cryoshroud for background heating and cooling. The cryoshroud is warmed and cooled using a recirculating gaseous nitrogen (GN2) system. The system utilizes compressor heat-of-compression to provide up to 60°C (140°F) wall temperatures, and a heat exchanger/liquid-nitrogen (LN2) desuperheater to provide temperatures down to –160°C (–250°F). 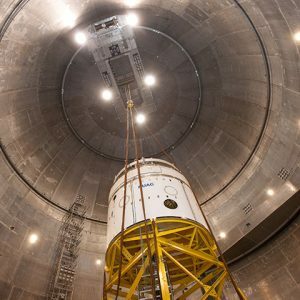 The facility is in the process of installing the ‘baseline’ cryoshroud configuration, a 12 m (40 ft) diameter by 12 m (40 ft) high cylinder centered in the chamber. The chamber provides in-chamber “low-power” connections and closed-loop controls for up to 33 channels of 1,200 W heater power, and is in the process of installing additional “high-power” connections and closed-loop controls for up to 10 channels of 50,000 W heater power. Data are acquired at the vacuum chamber via the Mobile Data Acquisition System (MDAS), a 256-channel high-speed digital system. Three each, 0.5 m diam. One each, 0.68 m diam. 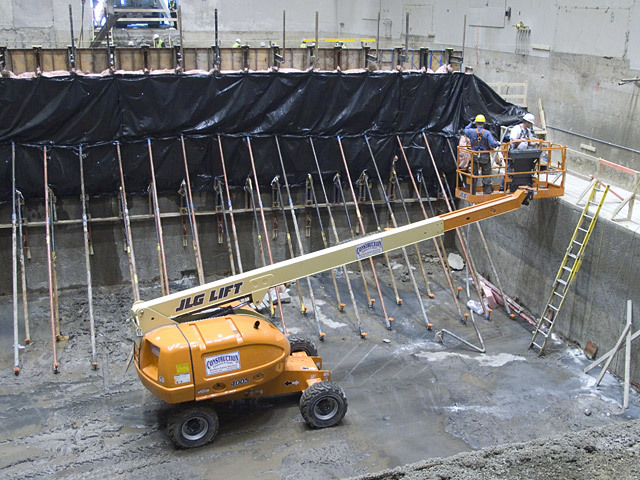 The Reverberant Acoustic Test Facility (RATF) chamber is located within the Vibroacoustic High Bay, taking advantage of the 1.8-m- (6-ft-) thick surrounding concrete walls to help attenuate sound migration through the SPF. The high bay also serves as redundant protection from the RATF nitrogen atmosphere during operation. The RATF is a 2,860-m³ (101,189-ft³) reverberant acoustic chamber capable of achieving an empty-chamber acoustic overall sound pressure level (OASPL) of 163 dB. The facility structure is designed for a future upgrade to 166-dB OASPL, including areas in the horn room wall which have been left blank for future installation of additional modulators/horns. The RATF includes various supporting subsystems including a GN2 generation system, horn room with acoustic modulators and horns, acoustic control system and hydraulic supply system. Test articles are mounted onto elevated customer-provided mounting fixtures for testing. The chamber has been constructed with load-bearing wall attachments for future installation of a 5-ton interior bridge crane. The chamber can be operated as a Class 100,000 clean room once the access doors are closed and the facility is cleaned. The combinations of servohydraulic and electropneumatic noise modulators utilize GN2 capable of producing a tailored wide range of acoustic spectra in the frequency range from 25 to 10,000 Hz. The RATF chamber internal dimensions are 11.4 m wide by 14.5 m deep by 17.4 m high (37.5 by 47.5 by 57 ft). 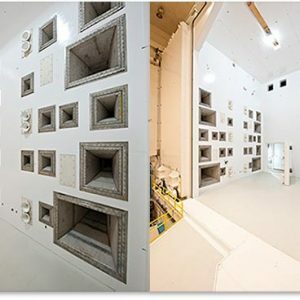 A photograph of the the Reverberant Acoustic Test Facility (RATF) horn wall is shown at left, and the overall chamber is shown at right. A maximum of 19 control microphones can be placed around the test article for closed-loop control using the acoustic control system (ACS). The ACS, control microphone or other response instrumentation (accelerometers, microphones) may be input into the analog abort system (AAS) to provide automatic shutdown capability. Each of 23 servohydraulic acoustic modulators is coupled with individual horns of six different cut-off frequencies. Each of 13 electro-pneumatic acoustic modulators is coupled with individual horns of one cut-off frequency. This combination of modulators and horns provides for an extremely variable and tailored acoustic spectrum. Threaded inserts are located in the floor for attachment of test article mounting fixtures. The east side of the chamber has a large rolling door and hinged door to provide access to the chamber up to 10.5 m (34.5 ft) in width. 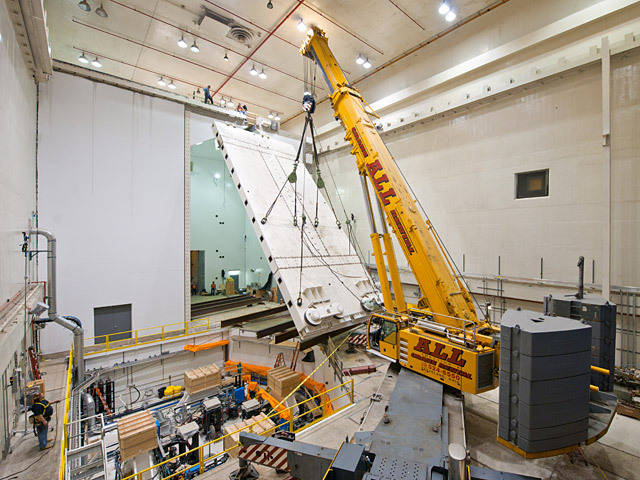 A 5.5-m-wide by 4.2-m-high (18- by 14-ft) door is located on the west side of the chamber for loading equipment when the vacuum chamber is occupied. The Vibroacoustic High Bay is secured, and support systems (hydraulics, compressed air, LN2, GN2, HVAC (heating, ventilation and cooling), and video) are set up and energized. A watchdog facility control system (FCS) monitors these subsystems and ensures that all permissives and interlocks are verified. The acoustic chamber is filled with a predetermined level of GN2. The FCS verifies that a matching modulator selection file agrees with the ACS and subsequently provides a run permit to the ACS. The ACS performs a self-check, and the operator initiates testing using the tailored choice of modulators/horns. The nitrogen generation system automatically vaporizes LN2 into GN2 as required up to 1,981 standard cubic meters per minute (70,000 scfm). At the conclusion of testing, fresh air is force ventilated into the chamber via the HVAC system to purge the chamber of nitrogen for safe entry. Temperature, humidity and oxygen monitors are located in the chamber and high bay. Data are acquired at the RATF via the facility data acquisition system (FDAS), a 1,024-channel high-speed digital system. The RATF has been tested up to a maximum OASPL of 161 dB and is currently undergoing characterization checkout testing in preparation for customer testing in early 2013. The following are various characteristics of the acoustic facility. 25 at 0.15 m (6 in.) diam., 2 at 0.20 m (8 in.) diam. bAcoustic overall sound pressure level. The Mechanical Vibration Facility (MVF is a three-axis, 6-degree-of-freedom, servohydraulic, sinusoidal base-shake vibration system located within the same Vibroacoustic High Bay as the RATF on the west side of the vacuum chamber. The proximity to the RATF allows shared use of the hydraulic system, safety systems, high-speed data acquisition system and surveillance system. The MVF system consists of reaction mass, 4 horizontal servohydraulic actuators, 16 vertical servohydraulic actuators mounted on double-spherical couplings, an aluminum table, a hydraulic supply system, table control system (TCON), vibration control system (VCON) and the same FCS used by the RATF. The MVF reaction mass includes an embedded steel plate for modal testing. The 2,100,000-kg (4,650,000-lb) reaction mass is used to resist the vibratory energy from the hydraulic actuators, table and test article, transferring the energy into the shale bedrock foundation. The reaction mass has been sized such that it has sufficient inertia mass and stiffness to react against the forces applied by the actuator/couplings during sine vibration testing. The reaction mass has been designed to accommodate future growth in vibration system and test article mass. The existing actuator and table design is for sine sweep capability of 0 to 1.25g (peak), from 5 to 150 Hz in the vertical axis and 0 to 1.0g from 5 to 150 Hz in each of the horizontal axes for a test article mass of 34,000 kg (75,000 lb) with a center of gravity elevation of 7 m (23 ft). Currently, the MVF controller is capable of sinusoidal control in three independent axes. 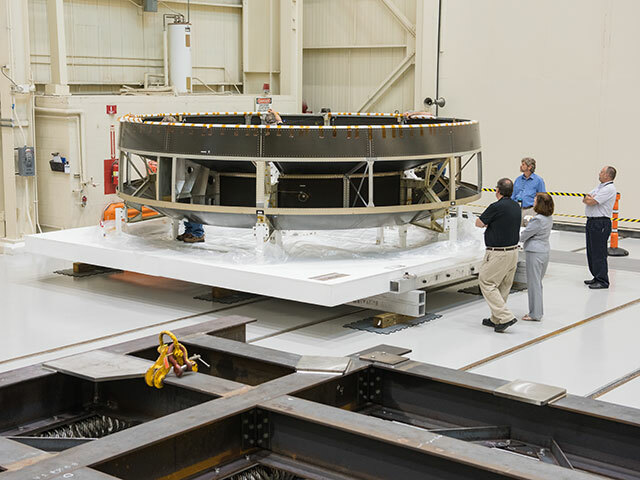 The MVF system design uses a large aluminum table approximately 6.7 m (22 ft) in diameter with a 0.61-m (2-ft) wide annular mounting surface centered about a 5.5-m (18-ft) nominal diameter. Table weight is partially off-loaded from the system via four inflatable airbags. Overhead view of the Mechanical Vibration Facility (MVF) system. The table vertical actuation is provided by 16 hydraulic cylinder actuators attached to the reaction mass onto which 16 double-spherical couplings are attached. The vertical actuator assemblies provide the controlled vertical sine vibration, enable horizontal vibration and provide overturning constraints during horizontal vibration. The table rests on the double-spherical couplings. The double-spherical couplings couple each vertical actuator to the table and provide high-axial stiffness to deliver the vertical vibratory force during vertical excitation. Each double-spherical coupling has internal pressure sensors to enable the vibration controller to limit forces. Four horizontal actuators provide the controlled horizontal sine vibration and comprise two single-ended pistons, which maintain outward force through hydrostatic pad-bearings to the table. The horizontal actuator assemblies provide vertical alignment during vertical actuation. The system is designed to permit testing in three independent axes without removing or lifting the test article from the table. A customer-supplied adapter ring is necessary to attach the test article to the vibration table mounting holes. The Vibroacoustic High Bay is secured, the support systems (hydraulics, compressed air, life safety, video and table mode) are setup and energized and interlocks are verified (including vibratory mode-choice setup) using the FCS. The TCON and FCS communicate with the table actuator servovalve drivers; position the table to a lifted, centered, ready position; and verify all servodrivers are started and ready. Operators then initiate the VCON to generate the sine wave inputs to the servovalve controllers, establishing vibration. The VCON controller generates drive voltage waveforms for each servovalve driver to satisfy the control and limit channel constraints from the test article (outer-loop control), and each servovalve driver maintains a closed-loop control to each actuator (inner-loop control). The VCON has 64 analog input channels, which can be assigned to control channels, limit channels or response channels, where the control and limit channels can be set to alarm and/or abort a test. Up to 44 of the analog input channels can be available for test article limit channels. Data are acquired at the MVF via the FDAS, a 1,024-channel high-speed digital system. The SPF commissioned a new 1,024-channel high-speed FDAS which serves the RATF facility. The architecture was leveraged to provide a separate, smaller-scale (256-channel) mobile data acquisition system (MDAS) for use with the thermal vacuum chamber. The FDAS system includes test article sensor interface cabling, signal conditioners, data recording, data storage, display and archive systems. The FDAS system can provide a minimum of 20 kHz analog bandwidth per channel, for all 1,024 channels. Data are synchronized by an external facility Inter-Range Instrumentation Group (IRIG)-B signal. Data are stored within four, 3-TB redundant arrays of independent disks (RAIDs). The FDAS currently has 800 signal conditioners of the integrated electronic piezoelectric (IEPE) type for accelerometers or microphone conditioning. After commissioning the FDAS system, the SPF constructed a close-coupled, 256-channel MDAS to measure the high-bandwidth thermal vacuum instrumentation signals using similar architecture to the FDAS. In addition, the thermal vacuum facility has a 512-channel digital temperature scanner system for any thermocouple type, which includes isothermal blocks, analog-to-digital conversion (ADC) and a microprocessor, which outputs temperature data to the MDAS system. 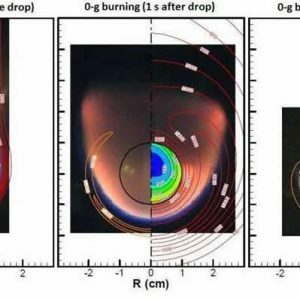 The MDAS and FDAS systems have successfully been used as the primary data systems for recent fairing deployment and acoustic tests. 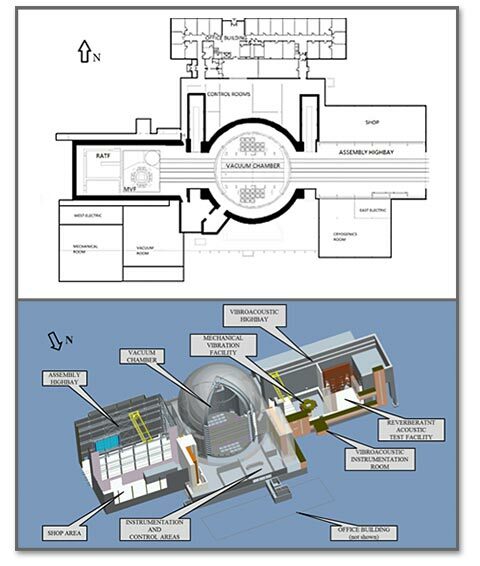 Space Power Facility (SPF) plan view and isometric drawing. The SPF was originally constructed in 1969 to perform nuclear and nonnuclear testing of large space systems needed for advanced missions beyond low-Earth orbit. 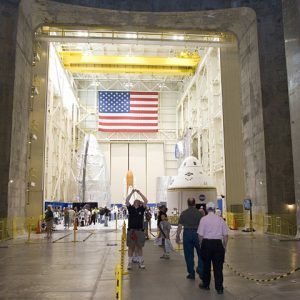 The facility was designed with excess capacity such as extremely large high bays, doors, power systems and supporting infrastructure to accommodate expanding test requirements well into the future of the space program. The SPF aluminum vacuum chamber surrounded by the concrete vacuum enclosure is central to the facility. The large east and west chamber doors (15 by 15 m) lead directly into large high bays. The high bay on the east side of the facility, the Assembly High Bay, is primarily used for receiving, assembling and preparing test hardware. 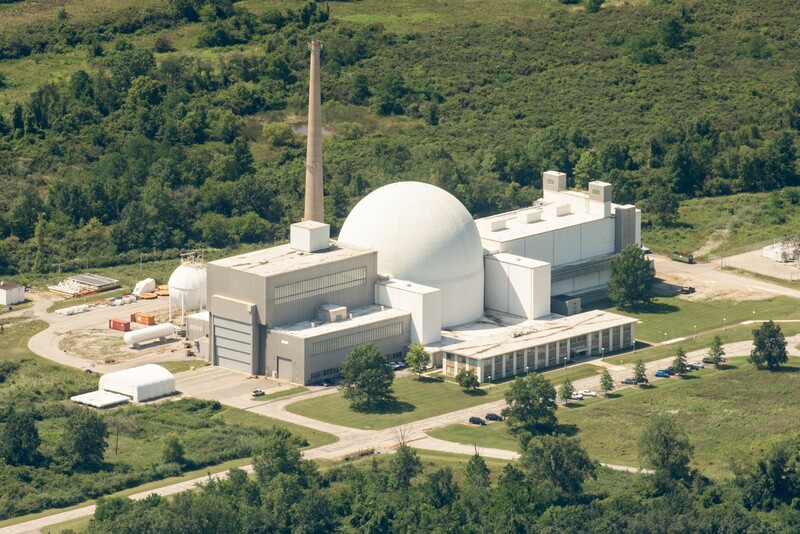 The high bay on the West side of the facility, the Disassembly High Bay, was originally constructed to safely disassemble nuclear components. The recent construction project converted this area into the Vibroacoustic High Bay, housing the MVF and the RATF. North and south of the chamber and high bays are various supporting areas. North of the chamber are the facility control rooms, signal conditioning and instrumentation areas, machine shop and two-story office building. The office building contains 41 offices and 4 conference rooms. 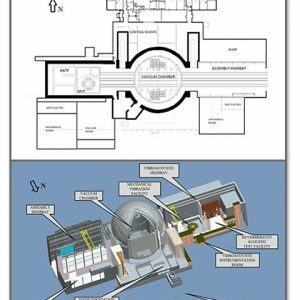 South of the chamber are the electric substations, cryogenics room, vacuum room and mechanical rooms. The south outdoor courtyard areas behind the SPF support the LN2 and GN2 storage bottles, vaporizers and cooling tower. 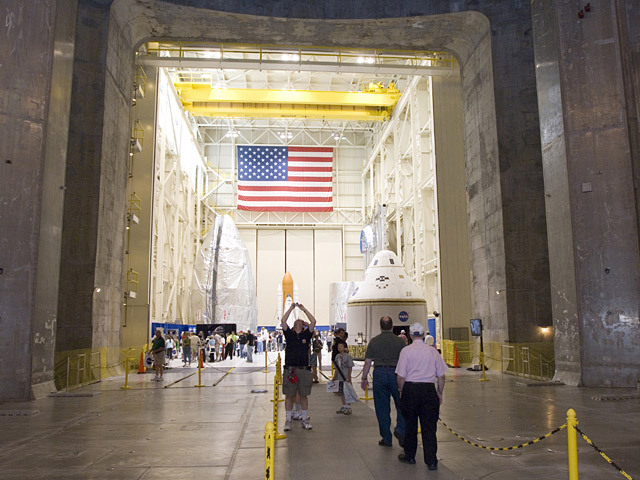 Adjacent and east of the vacuum chamber is the Assembly High Bay, primarily used for setup and assembly of test hardware and ground-support equipment. 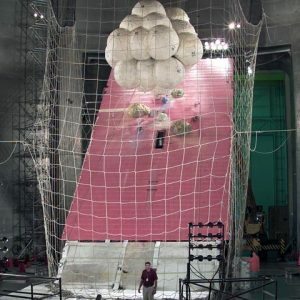 The high bay is approximately 22.86 m (75 ft) wide by 45.72 m (150 ft) long with a clear height under the 22.68 t (25-ton) bridge crane of 22.86 (75 ft). Doors leading outdoors and into the vacuum chamber measure 15.24 by 15.24 m (50 by 50 ft). 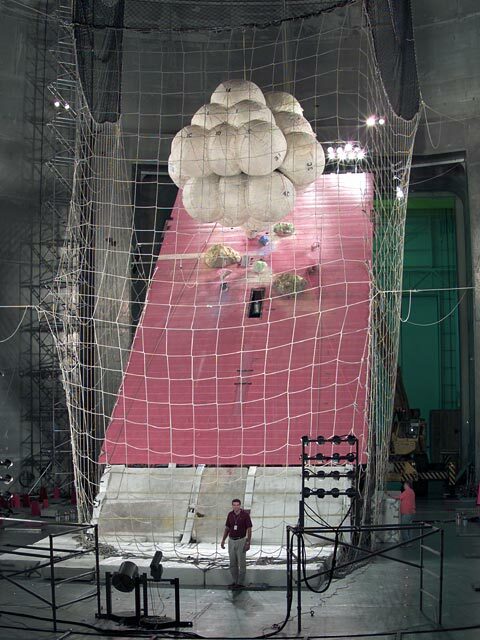 The high bay contains three sets of parallel, standard-gauge rail tracks to permit rolling stock and dolly transport from outdoors, into the assembly high bay, the vacuum chamber, and into the vibroacoustic high bay. 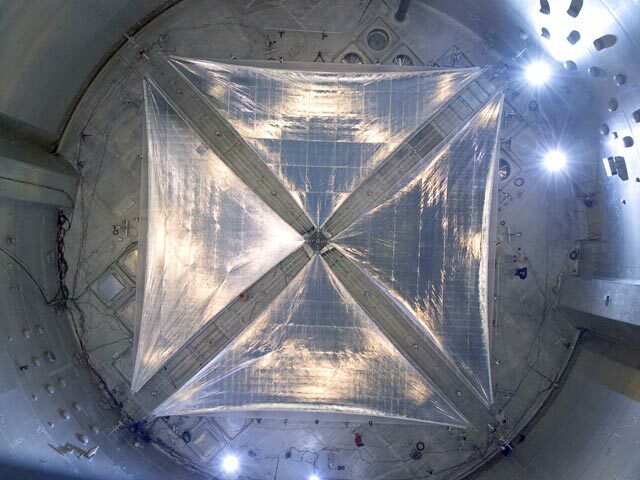 Adjacent and west of the vacuum chamber is the Vibroacoustic High Bay, which houses the MVF, a modal floor and the RATF facility. The high bay has a clear height under the (18.14 t) (20-ton) bridge crane of 62 feet. Doors into the vacuum chamber measure 15.24 by 15.24 m (50 ft by 50 ft). 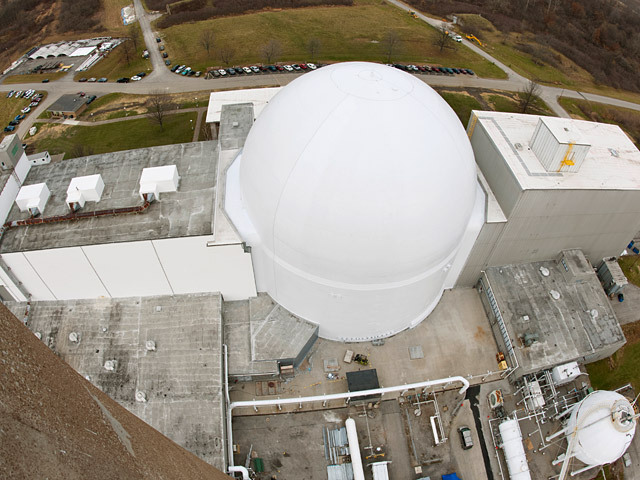 The SPF houses the world’s largest space environment simulation chamber, measuring 30.48 m in diameter by 37.19 m high (100 by 122 ft). In this chamber, large space-bound hardware can be tested in a severe environment similar to that encountered in space. The facility can sustain a high vacuum and simulate solar radiation via a 4-MW quartz heat lamp array, solar spectrum by a 400-kW arc lamp and cold environments with a variable-geometry cryogenic cold shroud. Large aluminum table – 6.7 m (22 ft) in diam. Recent hardware additions to the SPF include the RATF, a 2,860 m³ (101,189 ft³) reverberant acoustic chamber capable of achieving an empty-chamber OASPL of 163 dB. A further addition is the MVF, a three-axis, 6 degree-of-freedom, servohydraulic, sinusoidal base-shake vibration system located within the same Vibroacoustic High Bay as the RATF on the west side of the vacuum chamber. 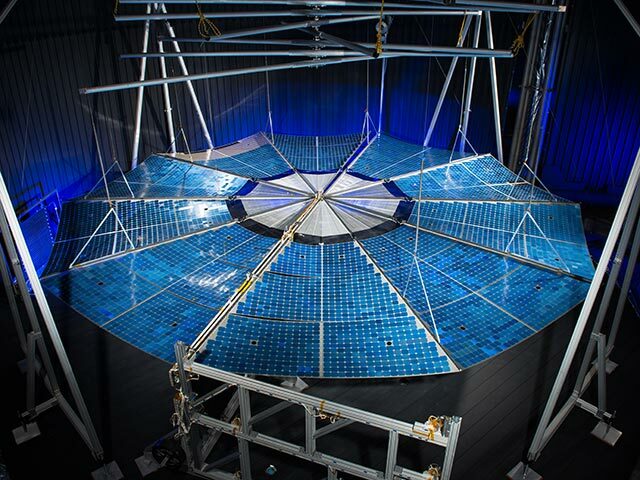 The SPF was designed to test nuclear and nonnuclear space hardware in a simulated low-Earth-orbit environment. Ithas supported Mars lander system tests, ISS hardware tests and rocket-fairing separation tests. Itsustains high vacuum, simulates solar radiation and produces cold environments via a cryogenic cold wall. The SPF has two 15.24 by 15.24 m (50 by 50 ft) entrances and a 18.14 t (20-ton) vacuum compatible polar crane on top of the chamber. 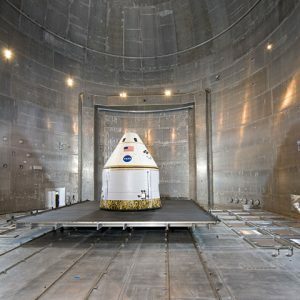 Offloading of the Orion crew module adapter. Orbital ATK, Inc., solar array deployment test. Interior of the Space Power Facility (SPF). 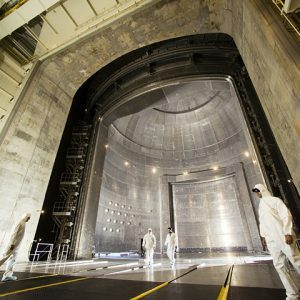 Post-construction photo of inside the Space Power Facility (SPF). 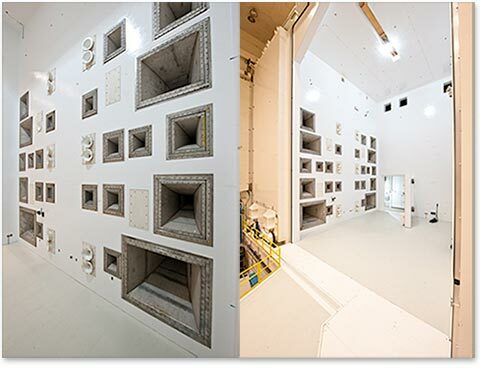 Reverberant Acoustical Test Facility (RATF) 68,039-kg (150,000 lb) sliding door installation. 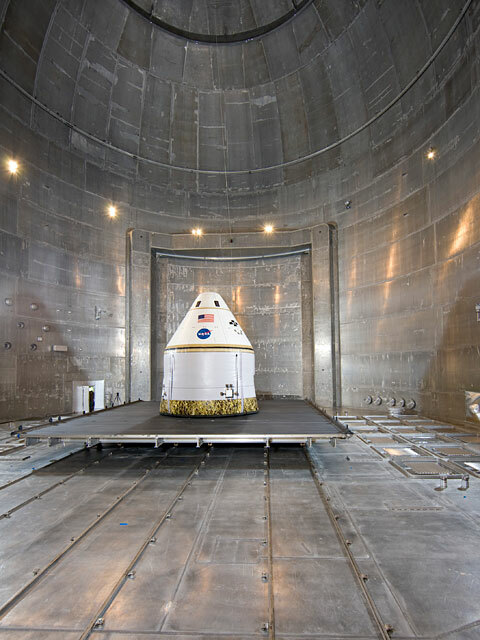 Inflated full-scale Crew Exploration Vehicle (CEV) command module mock-up inside the Station Space Power Facility (SPF) vacuum chamber. 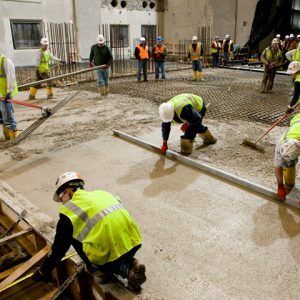 Workers laying concrete at the Space Power Facility (SPF). Tests of the Crew Exploration Vehicle (CEV) will be conducted after modifications to the facility are complete. 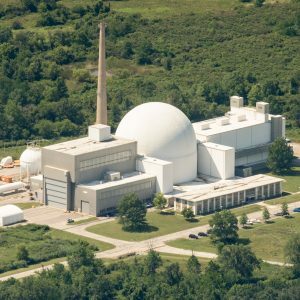 Public tour of the Space Power Facility (SPF) during a Plum Brook Station Open House. 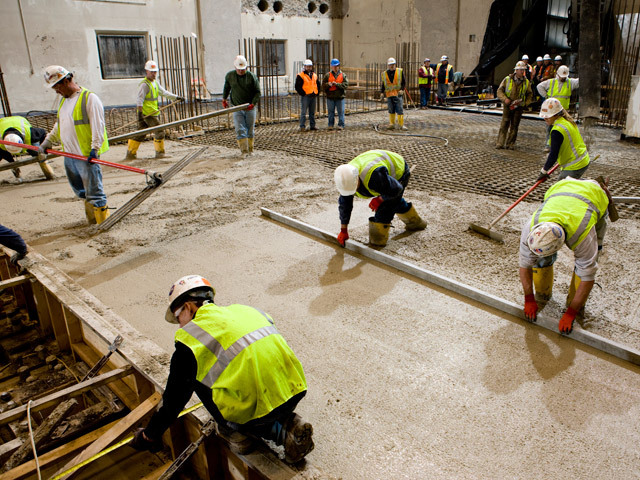 Workers prepare for a concrete pour at the Space Power Facility (SPF). Tests of the Crew Exploration Vehicle (CEV) will be conducted after modifications to the facility are complete. 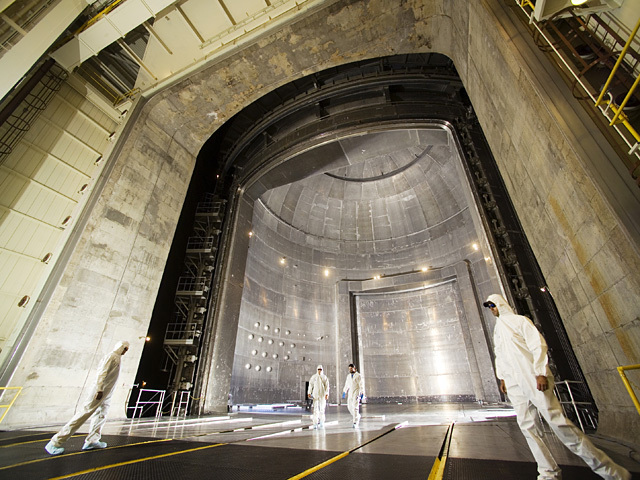 Wide-angle view into the test chamber of the Space Power Facility (SPF). 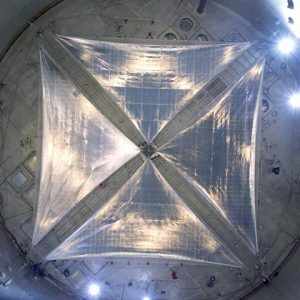 Orbital ATK Inc, I 20-meter (65.6-ft) solar sail being deployed in the Space Power Facility (SPF). 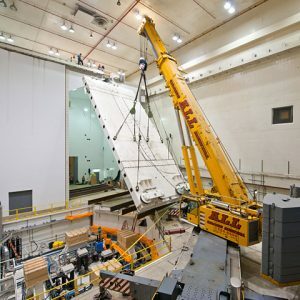 The Space Power Facility (SPF) has two 15.24- by 15.24-m (50 by 50-ft) entrances and a 18.14-t (20-ton) vacuum compatible polar crane on top of the chamber.